Technology affords us a very different camping experience than our parents or grandparents. The BioLite BaseCamp, a hefty little wood-burning stove, is a shining example of the innovation today’s campers can enjoy. Standing about two feet off the ground off the ground, it was designed for fuel-efficient clean wood burning by BioLite, an creative California company that first drew attention for the BioLite CampStove, essentially a more compact version of the BaseCamp. To describe the BaseCamp merely as a “wood-burning stove” is to greatly undervalue the fascinating technology that makes it tick. With a small bundle of wood, BioLite gets a piping hot, smokeless fire going with a self-powered fan, and it even generates heat-conducted energy. 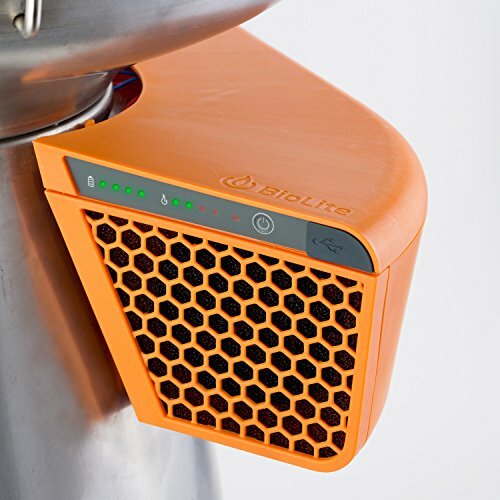 The BioLite BaseCamp is a weighty, compact and incredibly efficient clean burning grill. It has a small wood-burning tube–essentially a small furnace–where you place small pieces of wood. The fire then heats a small thermoelectric generator, which turns the heat into electric power. Once it generates 1 Watt of electricity, it begins to power a small fan that feeds into the the furnace, generating more heat and producing a near-smokeless fire. Better yet, once the battery absorbs more energy than what’s need to power the fan, you can begin using it to charge USB devices. After the fire’s finished, the fan-fueled heat burns all excess waste down to just a small, cool pile of ash, so cleanup is almost non-existent. The grill’s stove top includes a small flap covering the furnace exhaust. The flap can be left open for a dense, controlled heat source, or the closed flap can disperse the heat throughout the stovetop, which is the preferred usage for normal grilling. There’s no product quite like the BaseCamp, but there are of course several options on the market for a camp grill. And if you’ve got the $300 to spend on the BaseCamp (check this listing for the latest live prices), you certainly have a few options to choose from. With similar camping grills (too bulky for car camping but perfect for car camping), Coleman and Camp Chef both offer options very popular online for a significantly smaller investment. Though this doesn’t take into account the money saved from never having to refuel a gas tank. It’s hard to put a price on environmental impact too, but the BaseCamp certainly emits less greenhouse gases than either of these options. BioLite is a fascinating company, bringing some pretty exciting and innovative ideas to personal energy generation. 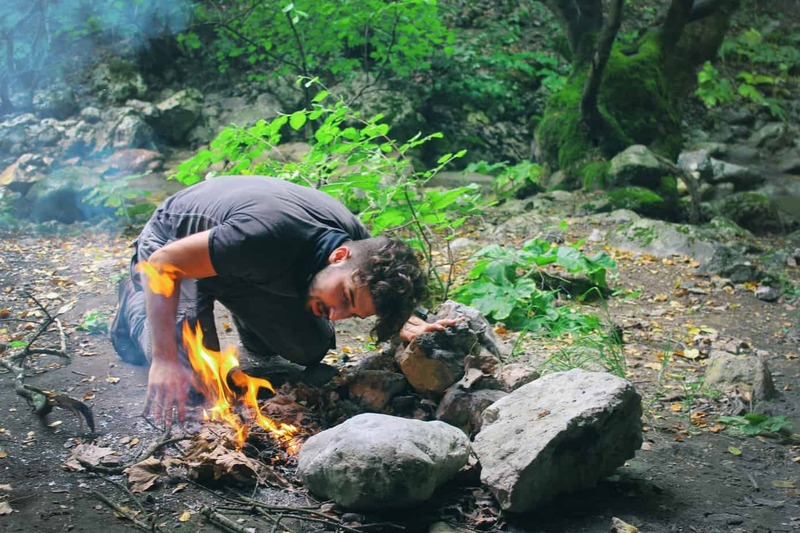 Although the success of their products has allowed them to grow into a more traditional company, their two best known products, the Basecamp and the CampStove, resulted from highly successful kickstarter campaigns. In 2008, the World Health Organization estimated that 43 percent of the world’s population, or roughly three billion people, cooked and heated their homes with smoky, open fires. Not only did these fires discharge a lot of toxic pollutants harmful to the climate, the chemicals emitted by these fires caused an estimated four million deaths annually. That’s more than AIDS, TB and Malaria combined. When BioLite’s founders Alec Drummond and Jonathan Cedar first began developing a clean-combustion stove, their goals were far less global. They hoped to create a cleaner, less fussy grill for environmentally minded campers; changing the world wasn’t on their to-do list. After shopping their first BioLite design around at conferences, however, they soon learned of the global problems their technology could help address. They quit their day jobs and began working on the product full-time to introduce to emerging markets. “That was a catalyst for me to decide that this wasn’t a night and weekend project, but one that I wanted to dedicate my life to,” Cedar told Mashable in a recent interview. 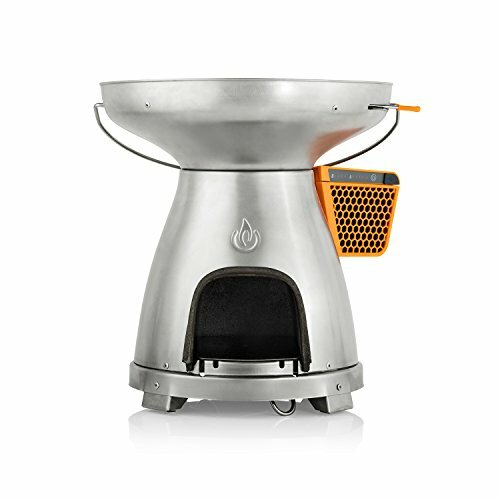 Today, BioLite produces a uniquely made stove for families living in impoverished countries for a huge discount (about $50 per unit). So while the $300 price tag on the BioLite BaseCamp (check this listing for the latest live prices) may seem pretty steep, it helps BioLite fund its humanitarian efforts around the globe. Weighing in at nearly 18 pounds, this thing won’t be going backpacking with you, unless you plan on bringing a wheelbarrow to lug it around. This is a fine grill for car camping, allowing you to skirt around open-fire campsite restrictions without using a gas grill. The BaseCamp was built to run on whatever biofuel is lying around. Just a few handfuls of wood will generate a large amount of heat thanks to the self-powering fan technology. It also comes with a few small fire-starting blocks. The BaseCamp has a stainless steel exterior and the interior stove is lined with cast iron. While you’ll need to pay caution to the external battery pack, it’s built to withstand great heat. Still, the BaseCamp can’t function in all conditions. Snow and rain–anything more than a light drizzle–will render it inoperable. So depending on the climate in which you’ll be camping, the BaseCamp might not provide the most reliable option. This is where the BaseCamp’s clean-burning tech really comes in handy. Usually, all that’s left at the end of a burn is a small pile of ash that can be quickly dumped out. Of course if you’ll be cooking on the grill, you will still want to soak the grill in water to clean it. 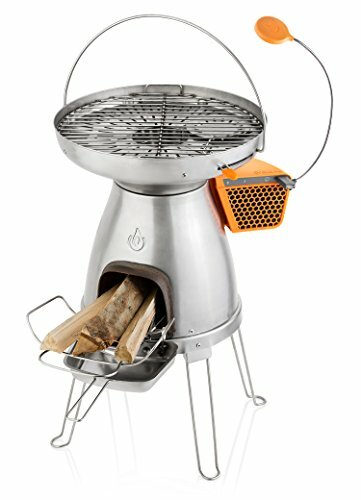 The BaseCamp sells for $299.95 (check this listing for the latest live prices) on both biolitestove.com and Amazon. It comes equipped with the aforementioned fire starters, a nifty little cooking light powered by the onboard battery, a tray to hold sticks too long to fit completely in the grill, and another tray to catch ash as the sticks burn. A carry pack is also available for $50. Some on Amazon complain that BioLite has been unresponsive to complaints about product defects, but the company promises a 1-year warranty protection for the original purchaser. The BioLite BaseCamp is a fantastic piece of technology. It’s innovative, energy-efficient and eco-friendly. That being said, there are a few practical drawbacks worthy of consideration. Its weight and price are the first two people should notice, but its sensitivity to inclimate weather and less-than-stellar warranty policy should raise concerns as well. 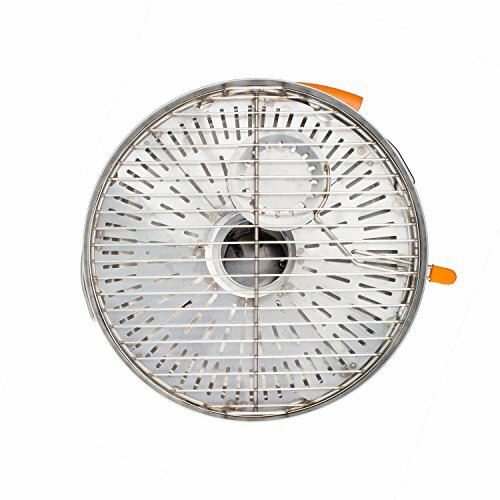 Overall, if you want a greener grill for your home or something to park next to your car campsite, then this is a fine choice that will cut down on your fuel costs (and probably impress some friends too). Don’t buy the BaseCamp expecting it to make your camping experience enormously easier, but what it does, it does very well.